Juniper Ridge Cascade Glacier Soap Review What is a jammy rose? * A little goes a long way, a nickel-sized amount is enough for me to cover my face and head. * The shave is extremely smooth, with a similar feel that I normally only get when I use a pre-shave oil. * Post shaving, my skin feels extremely soft and moisturized- much more than any other shaving cream I have used. I first heard about Racer from Barney at Fragrant Moments (http://fragrantmoments.net/2012/08/17/racer-shave-cream-by-portland-general-store/), and like him I was skeptical. I’ve been loyally using Art of Shaving’s brush-based system of pre-shave oil, shaving cream, and aftershave balm for years – so the idea of no foam seemed alien. After the first use, I was pretty much blown away. The cream is so slick that you don’t need a pre-shave. For guys who travel or want to shave at the gym, Racer is a great all-in-one product. The smell might detract for some people though – its described as “light-spiced oriental,” and Barney called it “slightly spiced, creamy, and woody.” To me, if you smell the container, I get spiced artisan whole wheat bread. That scent doesn’t last on skin, it’s just not what I expect from a shave cream. With that said, I can see myself using Racer for a long time to come – just the simplicity of not having to use a brush and a small container to pop into my dopp kit – makes it perfect for travel (and home use). The multi-use nature of Racer makes it the guys’ equivalent of a beauty balm. 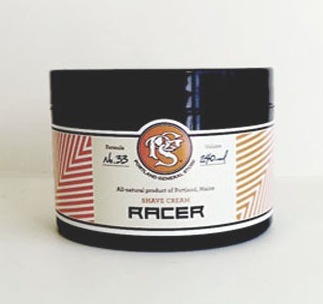 Racer Shaving Cream is available from the Portland General Store Website. Image courtesy Portland General Store Website. Sample provided by Portland General Store.